Twyla grew up in the country between Baldwin and Walsh, graduating from Sparta High School in 1986. 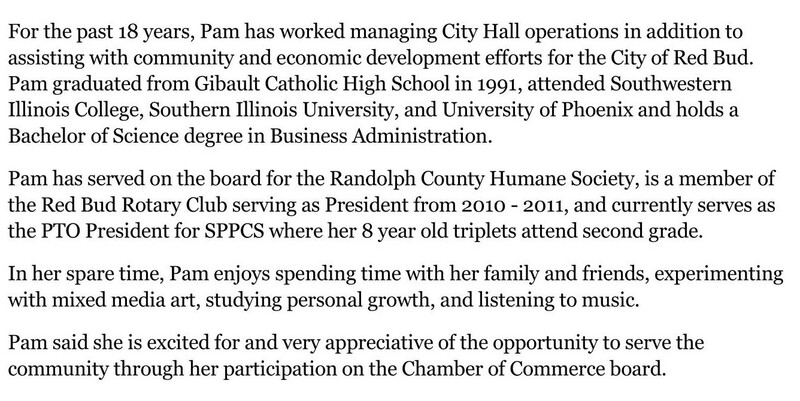 After high school, she worked as a Legal Secretary for the Law Firm of Nelson, Bement, Stubblefield & Rich in Belleville. She married John Schulte in 1989 and they moved to Red Bud in 1993. At that time, Twyla worked for Gateway FS in the main office as an assistant to the Controller. After the birth of her second child, she was a stay-at-home mom for several years, volunteering at St. John the Baptist Catholic School. 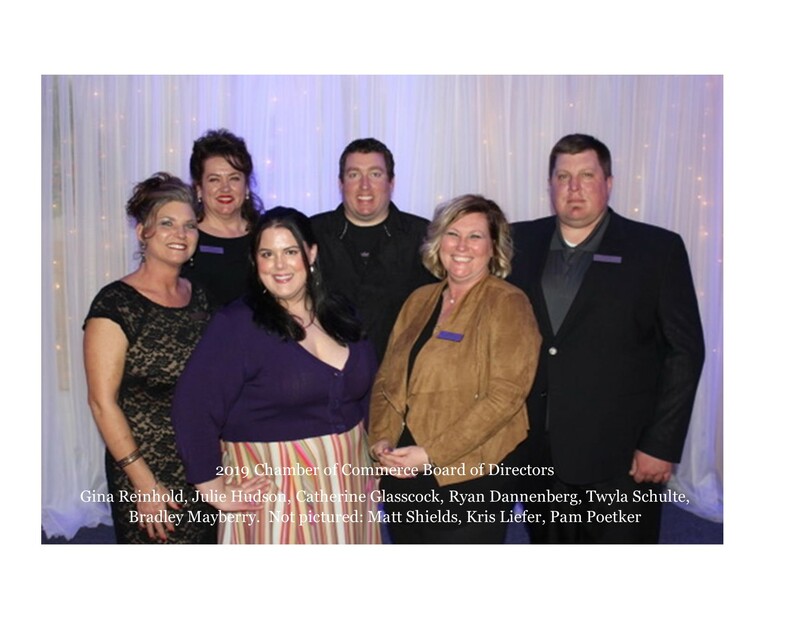 During her time as a volunteer, Twyla and a group of ladies were instrumental in starting the annual school auction that has become a tradition for 20 years. As soon as her youngest child went to school full time, she took a job at the Red Bud YMCA where she was the Program Coordinator for Monroe County. After the new facility was built near Waterloo, she became the Program Coordinator in the Red Bud facility and helped with the Soccer program, Day Camp and Healthy Kids Day. In, 1998, Twyla and John took on the adventure of becoming a business owner. They have now owned Twyla’s Flower Shop for 10 years. During that 10 years, the business moved from downtown Red Bud to the Park Plaza purchasing the old North County Savings Bank in 2012. In November 2015, she added a wine bar to the business and then added a clothing line a year later. Everyone that comes in says that it is a “one stop shop”. This will be Twyla’s second time serving on the Chamber Board, previously serving as Vice President and President. 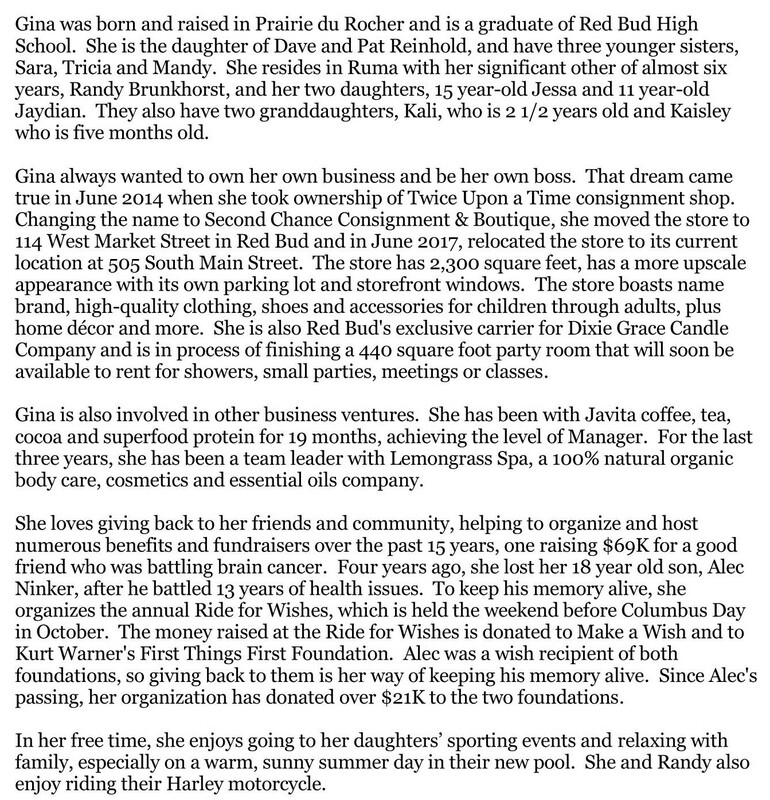 She was active in the start-up of the annual Lighted Parade and chaired the Annual Dinner and has the privilege of being part of the Committee for Santa’s Village. Twyla’s Flower Shop has been a Chamber member the entire 10 years that she has owned the business. She has been active with participating in all of the events hosted by the Chamber of Commerce and Beautification Committee. Twyla’s husband, John, works for Spirent Communications where he is the Senior Regional Sales Manager. Twyla and John have been married for 28 years and they have two beautiful children, Allie who lives in Edwardsville and is a Paralegal for Hepler & Broom, and Cameron who is a student at SIU-Carbondale and is studying Business Marketing. Matt was born and raised in Red Bud. A graduate of Red Bud High School, he went on to get his turfgrass science degree from Southwestern Illinois College. Matt was the golf course superintendent of Sparta Country Club for a while before he accepted the position as a plant health care specialist at Davey Tree Company. Currently, Matt is employed with the City of Red Bud and he has been there for 3 years. In his spare time, he enjoys golfing and watching the St. Louis Cardinals and Blues play. Matt and his girlfriend, Morgan Woosley, currently reside in Red Bud and they have a beautiful baby girl, Eleanor. Catherine moved to Red Bud in second grade and graduated from Red Bud High School in 2005. She worked at Keil’s throughout high school and then moved onto a law firm in Chesterfield where she worked for 2 years. Currently, Catherine works at Ironhorse and she has been there since April 2014. In her spare time Catherine enjoys going to Cardinal and Blues games and she is a big fan of musical theater. Catherine currently resides in Red Bud with her adorable Bichon Frise, Logan. Julie was born right here in Red Bud at St. Clement Hospital. She attended Red Bud High School graduating in 1978. She chose to begin working right out of school and got her first job as a legal secretary for the law firm of Nehrt, Sachtleben, and Fisher in Chester. She began working at Red Bud Regional Hospital (then St. Clement Hospital) on June 29, 1987 and currently serves as the Coordinator for the Healthy Circle Organization, Volunteer Services and the Community Relations Department. Julie married Chris Hudson in May of 1991. They have one son, Trevor, and a daughter-in-law, also named Julie, who resides in Waterloo. Chris and Julie have two dogs Buddy and Katie and one cat, Kitty. Kris was born and raised in Red Bud, graduating from Red Bud High School in 2009. He then attended Southern Illinois University-Edwardsville with a Bachelor’s degree in Business Management in 2013. After graduation, he returned to work with his father, Kevin, and two brothers, Kirk and Kent, at Cedar Hill Farms. Kris is also part owner of Lieferbrau Brewery and will be the head brewer. He and his wife, Danielle, have one son, Kolton, and they reside in rural Red Bud. Ryan graduated from Red Bud High School, Class of 2000 and from Southwestern Illinois College with an Associates of Arts degree in 2003. 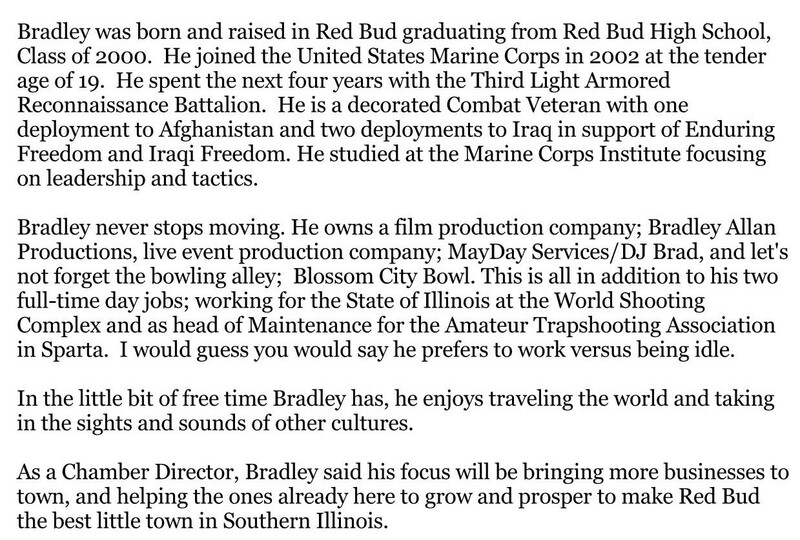 He then graduated from SIU-Edwardsville in 2005 with a Bachelor’s Degree in History. He is the proud owner of Vice’s Bar in Red Bud and also helps his father with the family farm and his brother, David, at the Opera House Bistro.